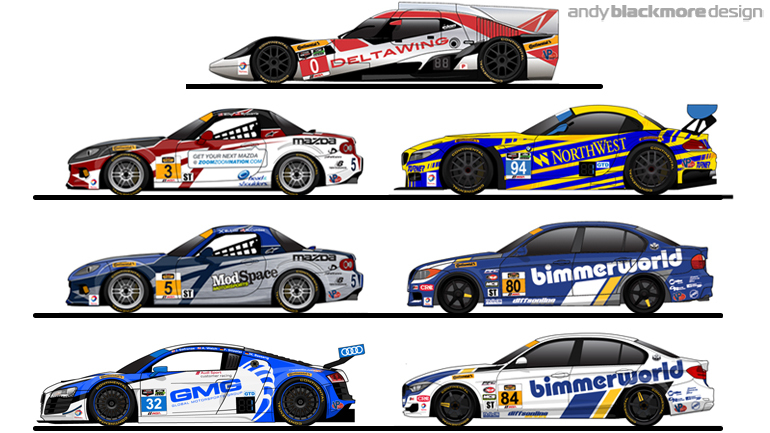 BimmerWorld Racing will enter their fifth year running ‘Andy Blackmore Design’ liveries in the 2015 Continental Tires SportsCar Challenge. After almost a decade of racing with the E90 chassis, team owner James Clay has upgraded both his entries to their in-house design BMW 328i Turbocharged F30 chassis. 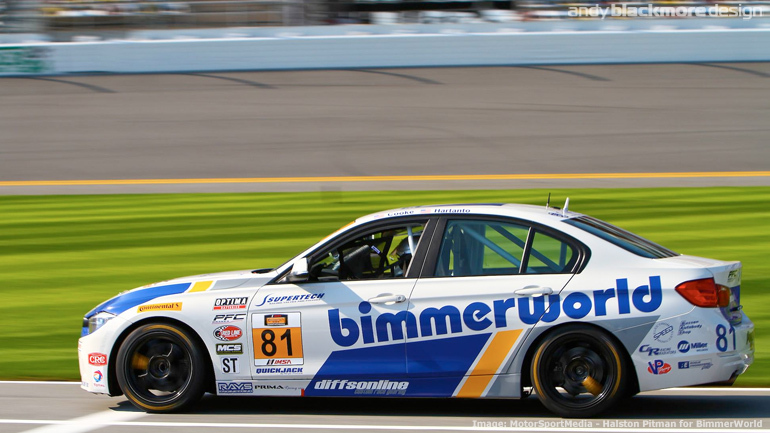 Originally introduced during 2013, complete with an all-new BimmerWorld Racing look, the team have been developing the F30 chassis alongside their older E90 racers. 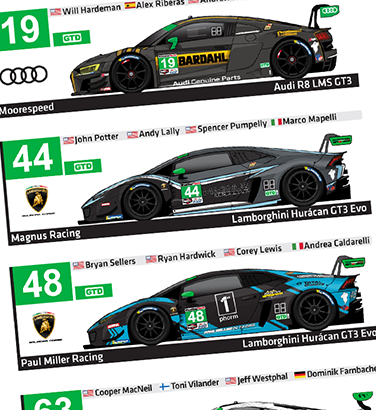 This year, the two entries sport different liveries, but retain a collective look but using similar graphic devices and color-breaks. 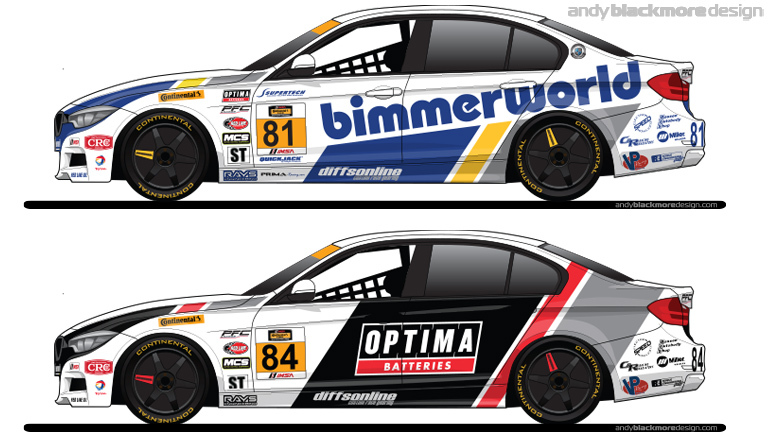 The #81 chassis retains the new BimmerWorld Racing look, with a tweak in coloration to tie-up with their new corporate graphics. 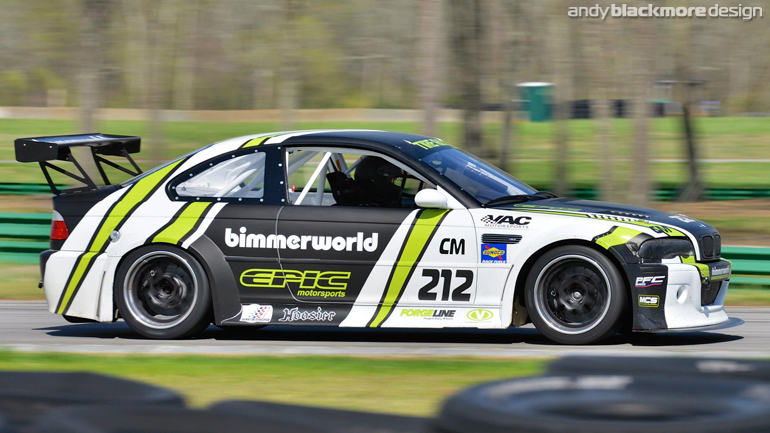 News – Epic Motorsports BMW M3 comes to life. This special wide bodied E46 has been in build during 2012 and the new Andy Blackmore Design livery has been applied. 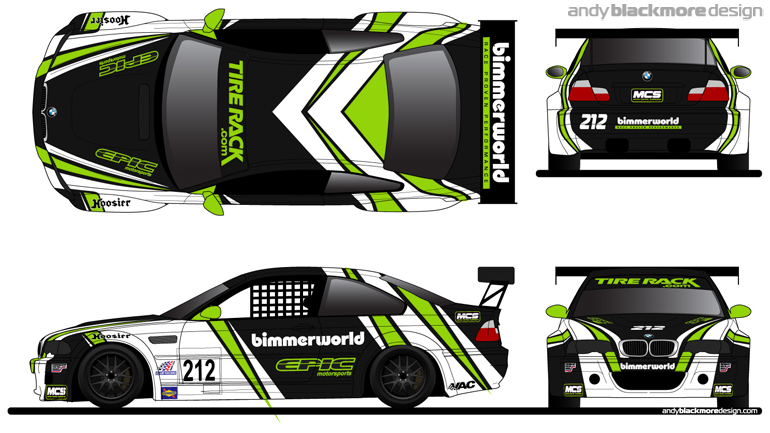 The Epic Motorsport/Bimmerworld entry will stand out on track like no other E46, just as requested in the original brief. You can read about the build here. I was fortunate to work on Eric Zimmermann’s new BMW M3 E46 wide body build, which is currently in construction at Bimmerworld. 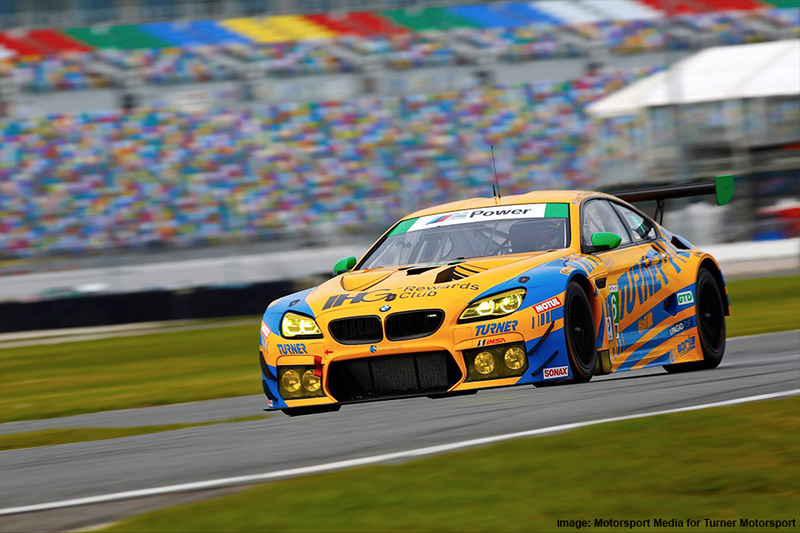 The car is scheduled to make its debut towards the end of the year in the North American BMW CCA Club Racing Series. 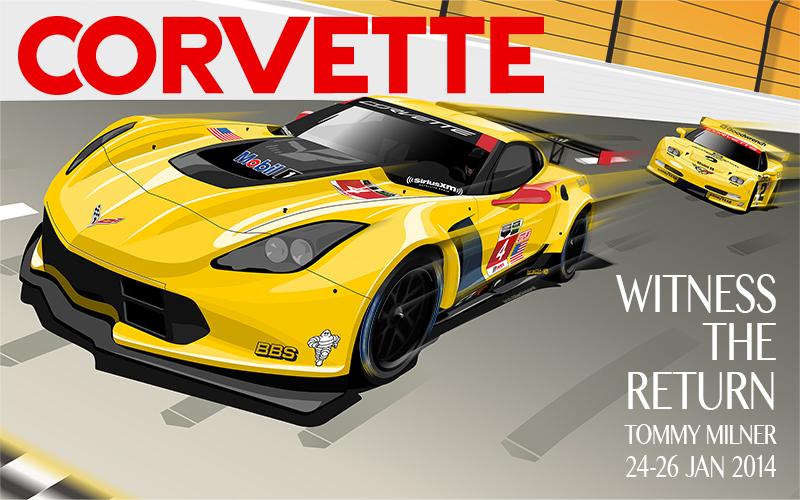 This was a great livery to work with with a relatively clean piece of (digital) paper to work from. 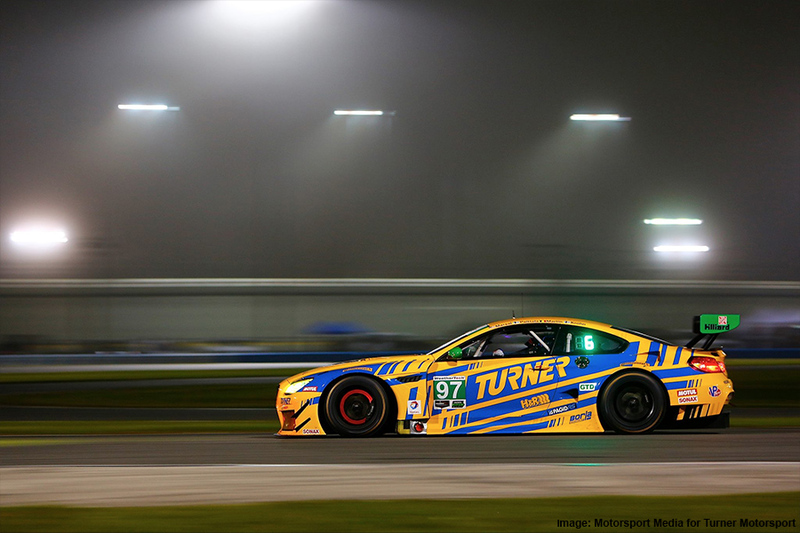 The brief was to design a striking livery. 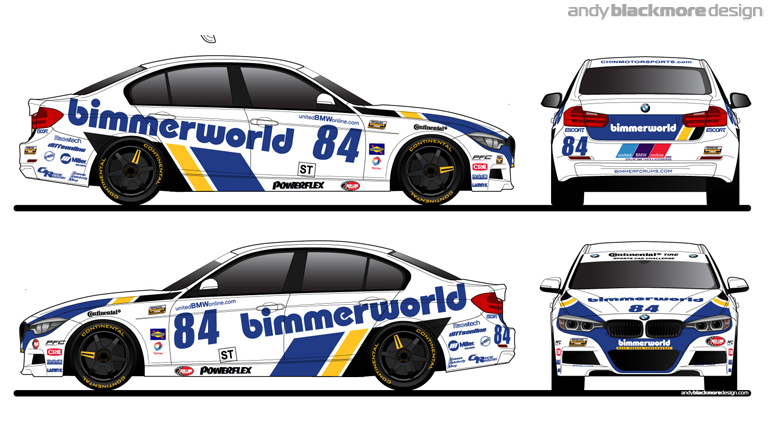 Following their 2011 livery, I was commissioned by Bimmerworld again to produce their 2012 livery. 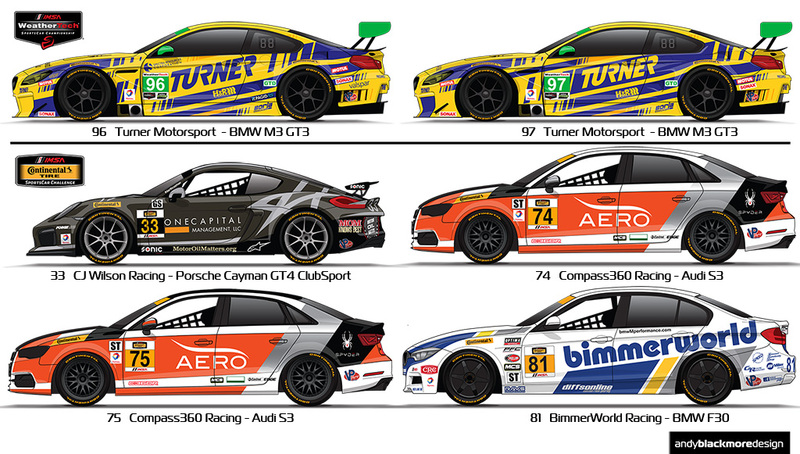 With the team focusing on the BMW E90 sedan in the GRAND-AM Continental Tires Series we were able to work through multiple designs to create a distintive design which shows off the Bimmerworld colors and corporate identity effectively with a BMW Motorsport inspired graphic on the Hood. I was also a consultant for a third entry, sponsoeed by CRC Brakes. 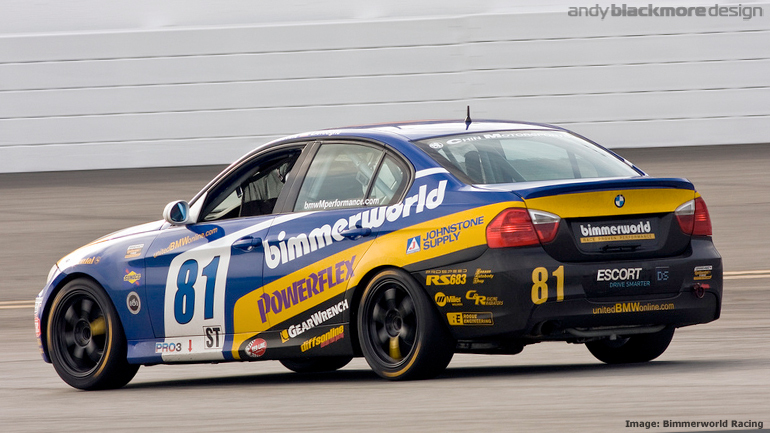 Front running Continental Tires Sports Car Challenge Team, Bimmerworld Racing returned to the track in 2011 with a fresh new livery on their BMW E90 and E90 M3 race cars. 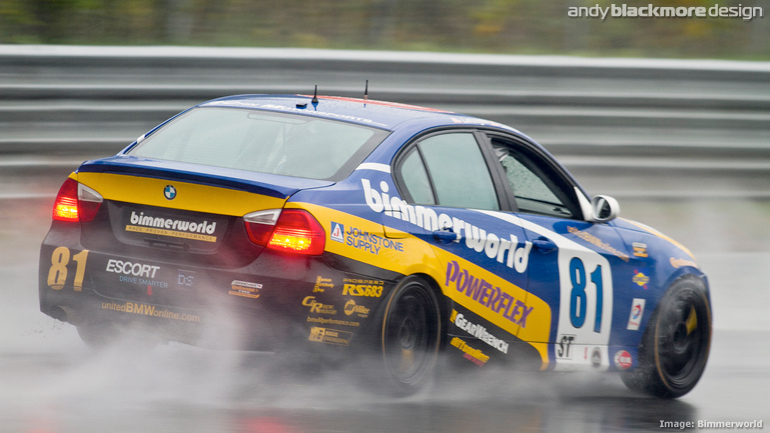 Bimmerworld owner, James Clay contracted Andy earlier in the month wanting a new look for the cars. 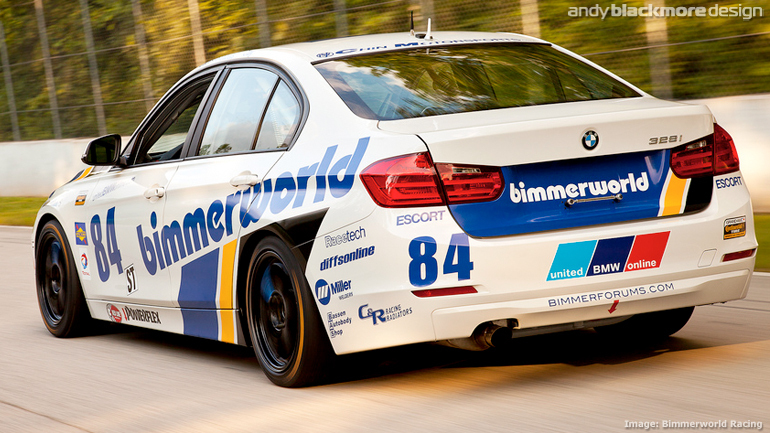 The Bimmerworld graphic is distinctive with its Blue, Yellow and White branding and Bauhaus font. Andy always likes to incorporate the numbers into the design and a few concepts later, this design was born. 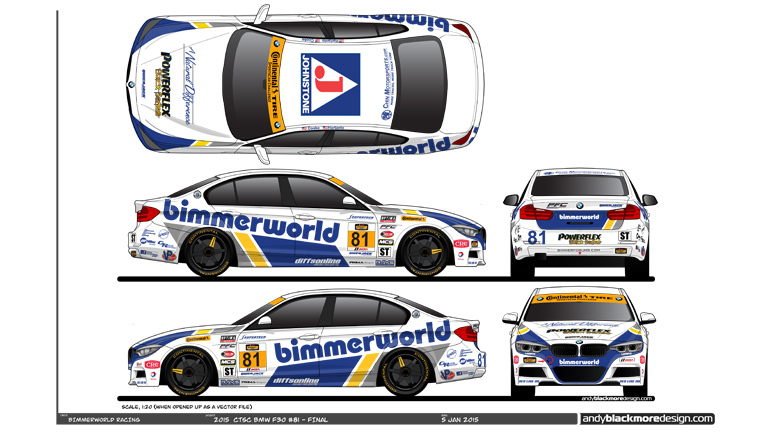 Bimmerworld have extended to a four car team this year, with two new M3 chassis in the GS class. 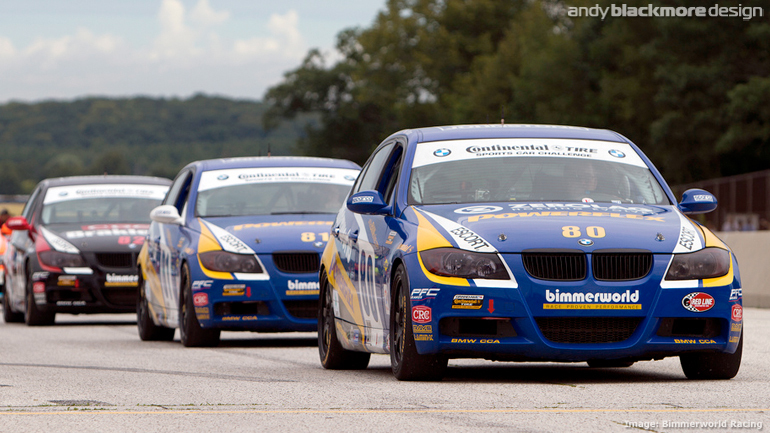 The M3 has Blue hood with White and Yellow BMW Motorsports Style stripes while the regular E90 sedans in the ST class have white hoods. 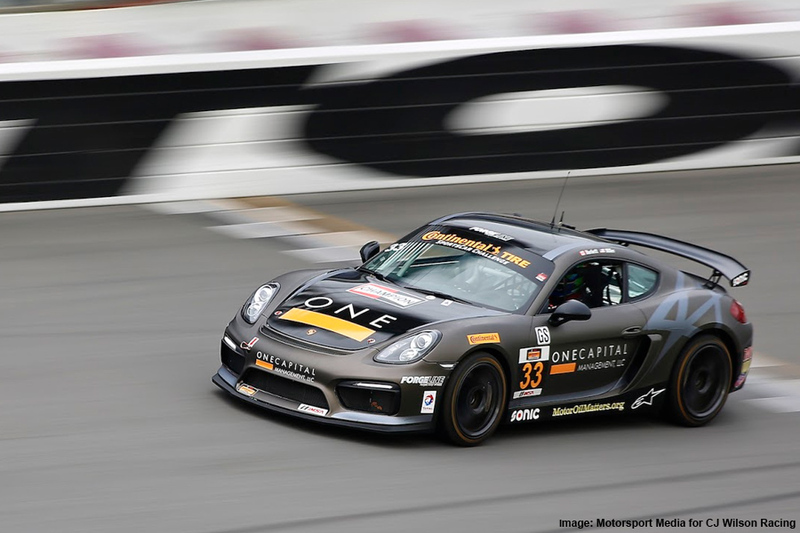 The team started the season with a podium for John Capestro-DuBetsand Gregory Liefooghe finished 3rd in the Daytona 200 season opener.